Traditional Irish music is a full body experience: the upbeat tempos compel you to dance a jig, clap your hands and join in. And that's what trad music is all about, joining in and having the craic (fun). First things first, learn the lingo. The two places you’re most likely to experience trad music in Ireland are a seisún and a céilí – and there's a difference between the two. A trad music seisún (pronounced: seh-shoon) can best be described as an informal gathering of musicians. Often, it’ll kick off with just a guitar. But before long you’ve got a whole group of fiddlers, flutists, banjos and bodhrán (drum) or Lambeg drum players belting out the tunes. You can expect a bit of dancing at seisúns, too. People clap along to the beat as dancers twirl and skip around. Don't be afraid to join in, no one minds if you don't know the steps. And before you know it, you'll be a jigging pro. In Armagh or Tyrone, you’ll probably find that an Ulster-Scots musical session is slightly more formal than the relaxed affairs, say, in County Clare. But the enjoyment factor is exactly on par for both. You’ll find a pub seisún in nearly every village, town and city on the island, especially on weekends, and usually in a pub. A céilí (pronounced like: kay-lee), meanwhile, is all about dancing to this music; and there's a huge emphasis on joining in with the locals. Every corner of Ireland has its own favorite dances, from jigs to set dances. Just like the dances, depending on where you are in Ireland the style of trad music will differ, too. Take County Clare where the style of trad reflects the landscape. From the Burren to the Cliffs of Moher, the landscape of County Clare is imbued with a poetic quality that commands you to slow down, and breathe it all in. As Martin Hayes, the renowned fiddler and Clare native, puts it, “we take things a little slower here, our music, too”. In the pubs of Clare they lean more towards a lyrical, lilting style of trad. But that’s not to say Clare doesn’t know how to enjoy itself – far from it. The pubs here are packed with locals and visitors almost every night listening and dancing to trad. 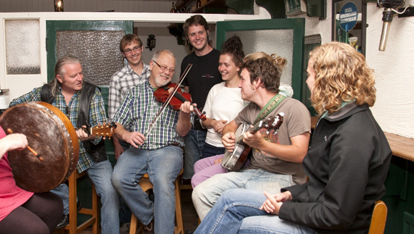 While the village of Doolin is known as the “traditional music capital of Ireland”. And music spills out onto the streets in Clare, too. Every August the Feakle Festival erupts onto the streets of sleepy Feakle village. “Feakle has this real folk feel to it,” says Martin Gaffney, one of the organizers of the All-Ireland Fleadh Cheoil na hÉireann, “everything takes place on the one street; you can’t help but feel right at home.” So you see, joining in the fun is what it's all about. When it comes to trad music, few places offer a better selection than Dublin City. Head straight for Temple Bar in the city center. This is the city's cultural quarter, the streets are lined with medieval cobble stones and it's here that Dublin comes to party. You'll find many trad pubs in Temple Bar, but one of our favorites is Oliver St. John Gogartys. You can't miss it (it's the one covered in flags). The trad music begins in the early afternoon here and doesn't stop until closing. Expect the odd bit of dancing inside, too. Temple Bar really becomes the trad capital of Ireland during the Temple Bar Trad Fest. This annual event sees Temple Bar fill up with trad musicians from all over Ireland and abroad. Every pub fills up with music, dancing and song. The streets are lined with buskers and a festival vibe grips the entire area. Lots of the events are free, too. Think of this as the Olympics of trad music. It's the single biggest gathering of traditional Irish musicians in the world. And this year Fleadh Cheoil na hEireann takes place in Drogheda County Louth. Musicians travel from around Ireland and abroad to battle through heats to win the final competition and eternal glory. A buzzing atmosphere, plenty of friendly banter and street entertainment are par for the course here. The city will be awash with bands, seisúns, street performers, ceilís, competitions and over 2,000 competitors. So then, to recap. You'll find trad music pretty much everywhere in Ireland. It's about having fun and joining in. Don't know the steps? Ask a local or just make them up, traditional Irish music is all about having the craic! Now, who’s for a seisún?